Second Amendment advocates descended on Waller County on August 12th to support a fellow Texan who was sued by the County after he served notice on them alleging a violation of Texas gun rights, as reported by Breitbart Texas. In a show of support, the gun rights advocates at the open carry protest went to the Waller County Clerk’s Office to file their own complaints against the County. A video of them bringing their complaints to the Clerk is included in the article. Breitbart Texas was in Waller County for the protest and has been reporting about the conflict between gun rights activists and County officials. The gun rights advocates say officials are being “tyrannical” “bullies” and are abusing their power. Right after the protest, the Second Amendment activists learned that Attorney General (AG) Paxton had sent Waller County officials a notice that they were in violation of the law. The AG gave county officials 15 days to cure the violation and put it on notice that the Office of the Attorney General (OAG) may file suit and seek $1,000 – $1,500 for the first violation, and not less than $10,000 – $10,500 for any second and subsequent violation. Each continuing day constitutes a separate violation under Texas law. Waller County officials say that the courthouse is legally off-limits to licensed gun holders and that allowing citizens to carry inside the courthouse in violation of state law subjects witnesses and parties to a lawsuit, judges, attorneys, officers and prosecutors, “to an unnecessary and unjustifiable risk.” The lawyer for Waller County, District Attorney Elton Mathis told Breitbart Texas, “The commissioners court is adamant that guns will not come in the courthouse.” County officials do not believe that the Texas Legislature has intended the “sweeping interpretation” that the gun rights advocates are giving it. 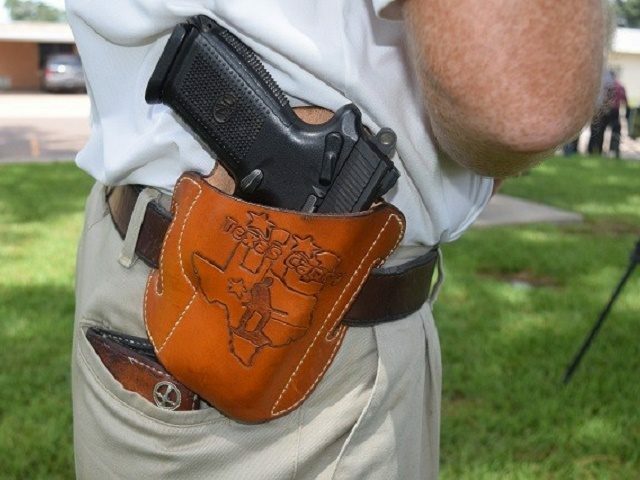 Waller County filed a lawsuit against Terry Holcomb Sr., the founder of Texas Carry, a guns rights organization that sent the County a notice complaining that it was in violation of Texas law by excluding licensed to carry (LTC) holders, as reported by Breitbart Texas. D.A. Mathis says that the issue of where and when folks can carry near and in a courthouse needs to be legally interpreted in the court system. The County sued Holcomb, a resident of San Jacinto County, in order to have rights and duties under Texas law legally declared by a judge, he said. “All Texans should welcome this resolution,” he added. Section 411.209 prohibits state agencies and political subdivisions from wrongfully excluding handgun license holders from property owned or leased by the government. The law prohibits a governmental entity from providing notice by a communication described in Texas Penal Code § 30.06, or by any sign expressly referring to that law or to a concealed handgun license, that a license holder carrying a handgun is prohibited from entering or remaining on a premises or other place owned or leased by the governmental entity unless the license holder is prohibited from carrying a handgun on the premises or other place by Texas Penal Code §§ 46.03 or 46.035. The gun rights advocates say they will pursue the matter all the way to the Supreme Court if necessary. They urge that such action by governmental entities cannot go unchallenged because it could encourage “anti-gun officials” who want to silence the voices of gun owners defending their Second Amendment rights.